Yulia Egorova is a Senior Lecturer in Anthropology at Durham University. Her research interests include anthropology of Jewish communities and the relationship between science and religion. She is the author of Jews and India: Perceptions and Image, and a co-author (with Tudor Parfitt ) of Genetics, Mass Media and Identity: A Case Study of the Gentic Research on the Lemba and Bene – Israel. The Jews of Andhra Pradesh is an engaging and thought – Provoking ethnography devoted to the Bene Ephraim – a Dalit group in India that has embraced Jewish tradition. Egorova and Parwaz offer a nuanced and atheoretically-informed account which explores how the story of the Bene Ephraim challenges and extends contemporary understanding of Jewishness and illuminates radical new directions in Dalit discourse. 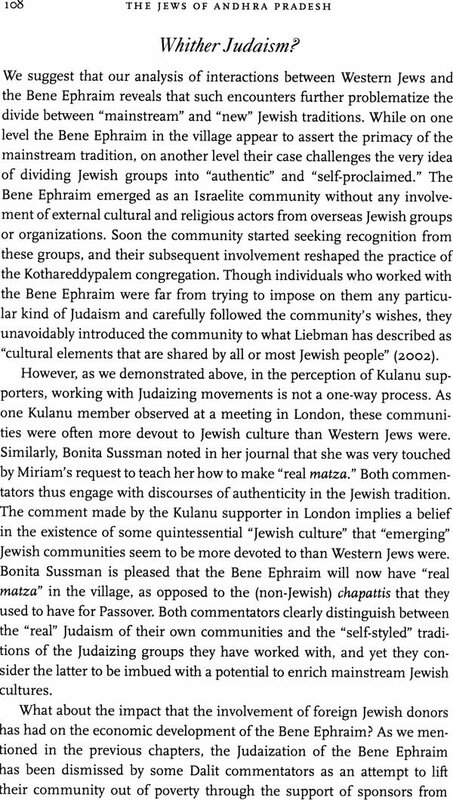 The authors research involved a year of ethnographic fieldwork conducted among the Bene Ephraim, analysis of the community's narratives, and in-depth interviews with the Bene Ephraim, their neighbours, and members of different Jewish organizations in India, Israel, and the US. Presenting the fascinating story of this group and situating it in its wider political and social context, the authors show how the example of the Bene Ephriam can shed light on such topical issues as the caste system and social mobility in India, the conflict in the Middle East, and debates surrounding the Law of Return in Israel. It makes an important contribution to anthropology of Indian Dalits, anthropology of Judaism, the study of religion, and broader theoretical discussions about contested forms of self – identification and pathways to social liberation. The Jews of Andhra Pradesh is one of very few detailed ethnographies of emerging Jewish communities and will attract attention among both academic and wider audiences. The Hanukkah Service in the village began shortly before noon with around thirty members present. Soon after, more people from the village came in, bringing the number of participants to about eighty. They sang and they prayed – most songs and prayers were in Telugu, and some were in Hebrew. After the service was over the ceremony of the Torah scroll introduction began. Jacob, the son and nephew of the congregations' leaders, lifted the scroll and placed it on the platform built for this occasion outside the synagogue. The leaders – Sadok and Shmuel Yacobi –blessed Jaciob, gave him instructions on how to open the scroll, and he carefully lifted it for everybody to see. He then circumamblated the synagogue seven times, community members following him – all dancing, drumming, and chanting "long live Bene Ephraim." Jacob came back to the platform and showed the scroll to the congregation amidst loud cheers. The people then followed him into the synagogue, where he raised the scroll and took it around the room, so that everyone, including the children, could touch it. After that, his uncle, Shmuel, read a few lines from the scroll. Eventually Jacob closed it, put in a box and placed the box on a specially designated shelf. Everyone came out and took their seats on the chairs under the roof – tent. Community leaders took their places on the platform. First Shmuel talked about the historical context of Hanukkah and the message that it sends to the people. They then called to the stage Shahid and a Young orthodox Jewish man from Amsterdam who came to the village with a film crew to make a reality TV show. After the speeches and a vote of thanks from Jacob and his sisters, most of the congregation departed to their houses. Those who came from outside the village stayed back to have lunch prepared by Jacob's mother. This ceremony of the Torah scroll introduction took place in the village of kothareddypalem in the Bene Ephraim community synagogue and was part of Hanukkah celebrations. The Bene Ephraim are a group of Christianized Madiga Dalits (untouchables) of the Guntur district in the Indian state of Andhra Pradesh, who in the late1980s announced their descent from the Lost Tribes of Israel and their link to Judaism. The group formally proclaimed their religious affiliation in 1991, when its leaders, brothers Shmuel and Sadok Yacobi, established a synagogue – the first ever Jewish hall of worship in the history of Andhra (see fig. 1.). Their small congregation began to observe the Sabbath, to eat kosher food, to circumcise their male children, and to celebrate Jewish festivals. The Bene Ephraim at the same time started seeking contacts with overseas Jewish communities and looking for ways to immigrate to the State of Israel. In the meantime, community leaders recorded their origin narratives, which emphasize the antiquity of Bene Ephraim and the authenticity of their Jewish past. This book is an anthropological study about the multiple and diverse meanings of jewishness and the way these meanings are employed and extended by a Dalit group in Search of its Place in Indian society and in the world. 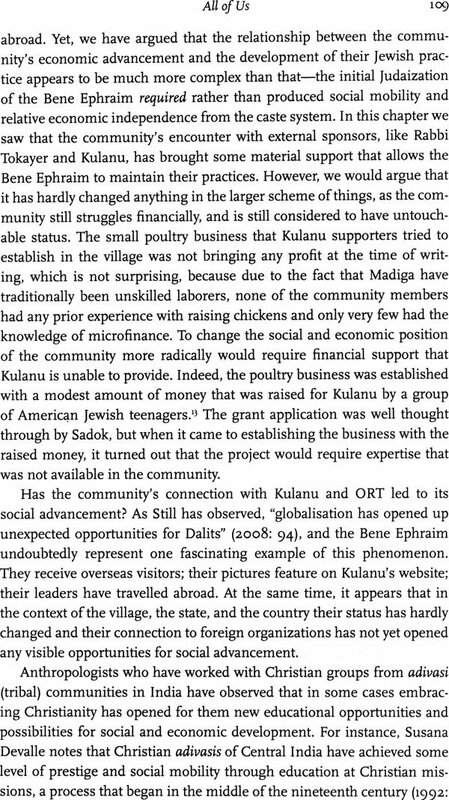 We address these issues through the story of the Bene Ephraim and of their complex relations with their village neighbours, with local and national authorities, and with Jewish and Israeli organizations, and demonstrate how a Dalit community has reinterpreted Jewishness as a form of social protest. The brief episode from the life of the community with which we started the chapter encapsulates a number of important aspects and challenges of being jewish in Andhra Pradesh, and points to some of the main themes of the book. The (replica) Turah scroll, which was donated to the community by two visitors from New York, Indicates that the Bene Ephraim have already succeeded to some extent in establishing a connection with Jewish people from abroad. It also indexes their dependence on foreign donors. The Bene Ephraim's eagerness to celebrate Hanukkah – a jewish festival that is not associated with the history of the Lost Tribes – and to host a European Jewish reality TV show both symbolize their desire to join world Judaism and suggest that to do so they had to amend their own tradition in accordance with more mainstream Jewish practice. Finally, the episode highlights that the organization of the community's life depends to a large extent on the efforts of one family that is charged with the task of defining and defending community boundaries. The book will present the story of this community and will situate it in its wider political and social context. We will demonstrate how the example of the Bene Ephraim can throw light on a wide range of issues in national and international politics, such as the caste system and social mobility in India, the conflict in the Middle East, the rhetoric of the "war on terror," public understandings of what it means of be Jewish, and debates surrounding the Law of Return in Israel. We will examine who forms the Bene Ephraim community at the moment, and who can claim membership in it in principle. We will discuss how the definitions of what it means to be a Bene Ephraim have been changing in the past twenty years and how community members see their relationship with and historical connection to other Madiga and to the wider Indian society. Throughout the book we will be interrogating the specificity of Bene Ephraim Judaism, the community's understandings of jewish culture, and the mechanisms through which their practice is developing. In what ways do the Bene Ephraim consider themselves to be Jewish? Are there any differences in the way individual Bene Ephraim view the Jewishness to their community? Which particular jewish practices have the community chosen to adopt, and what kinds of channels are its members using to obtain knowledge of Jewish tradition? The book will also discuss how the Bene Ephraim are perceived by a wide range of actors, from their neighbours in the village and the local authorities, to jewish communities around the world and in the State of Israel. Are they still seen as Madiga untouchables or has their Judaization helped them raise their status in the local hierarchy? Which Jewish organizations around the world have proven to be sympathetic to or cautious of their claims? Which Political groups and actors in Israel support or oppose their cause and for what reasons? Did the desire of the Bene Ephraim to move to the Promised Land affect the trajectory of their tradition's development and the way they define community boundaries? On a more general level, we will discuss how the Bene Ephriaim Compare to other Judaizing communities around the world and how they challenge conventional understandings of what it means to be Jewish. In the context of Indian politics, we will consider how their social liberation strategies mirror or contest those of other Dalit movement. Finally, the book will use the example of the Bene Ephraim to reflect on the wider questions of conversion and the legitimization of identities. Which "identity markers" has the community deployed in negotiating their place among other Jewish groups of the world? To what extent and in what ways are Bene Ephraim modes of self – identification being shaped by the responses of others, both on the macro level of national and international politics and on the micro level of everyday interactions in the village? What does this case study tell us about the relationship between external categorization and internal group identification? In the last two sections of this introduction we will explain how each of the chapters attempts to answer these questions, and what methods we used in our study; but first, let us look at the literature that has engaged with academic debates relevant for our discussion.